When you start using COMSOL, we will hold a training course at your company premises, showing you all the basics you need for simulating with COMSOL Multiphysics. A maximum of 10 participants has proved to be most effective. 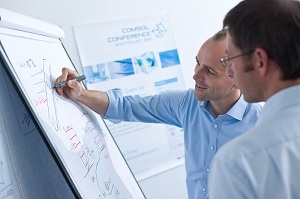 One of our COMSOL experts will come to you and train you on one or several days. If the topics are discussed in advance, the trainer can focus directly on your problems and deal with them specifically with you. The advantage for you: The course is directly tailored and designed for you and your company. Furthermore, at the end of the day, all participants have reached the same level.